Grail Games is proud to bring you this new, cute and humorous game from Japan! The Prince had fallen in love. Unable to take his eyes off the mysterious Cinderella from the moment she had walked into the ballroom, the Prince had danced, talked and smiled with her for hours. And then the clock struck midnight. Without warning or reason, Cinderella had gathered up her dress and run out of the ballroom, through the palace and out the front door. Prince Charming called out after her but to no avail – she was gone – save for one of her shimmering glass slippers, left behind on the grand staircase. 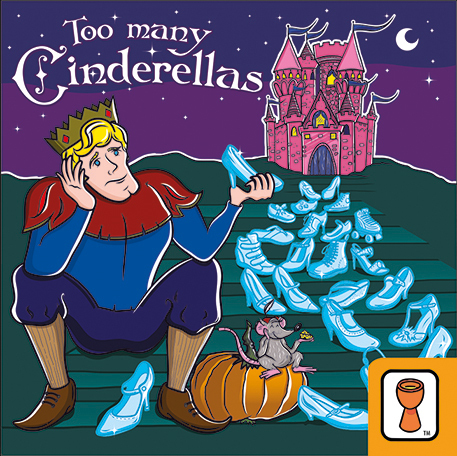 Too Many Cinderellas is a card game in which players take on the roles of some of the influential people in the kingdom. 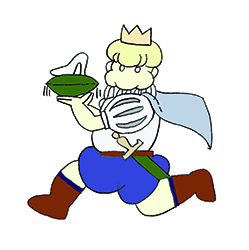 Your job, using the confused memories of the Prince to your advantage, is to make him come to believe that your servant, friend or relative is in actuality Cinderella. Can you persuade the Prince to marry who you choose? Of course, other informants are spreading similar rumours and gossip about their own candidates, so you must be prepared to assertively dismiss some of what others will tell him, without giving away your true intentions. Many candidates for Cinderella will be offered to the Prince. Who will he believe and which Cinderella will he decide to marry? Previously published in Japan by Taikikennai Games.